This layout is AMAZING! I love Note to Self and you did a fantastic job with it. That would probably freak me out too!! lol!! But glad that it didn't taste like spaghetti!! I love love love your lo!! I always am inspired by how you use journal tags on your pages!! BEAUTIFUL!!!! wow for sure!! so much to look at and the photo is especially awesome. fantastic work Lisa!! Lisa, I just love how you create layouts!! This layout is great with all the little bits here and there! You know how to use line!! Very fun page! Love all the goodies. Great pix! Love this bright and cheery masculine page! 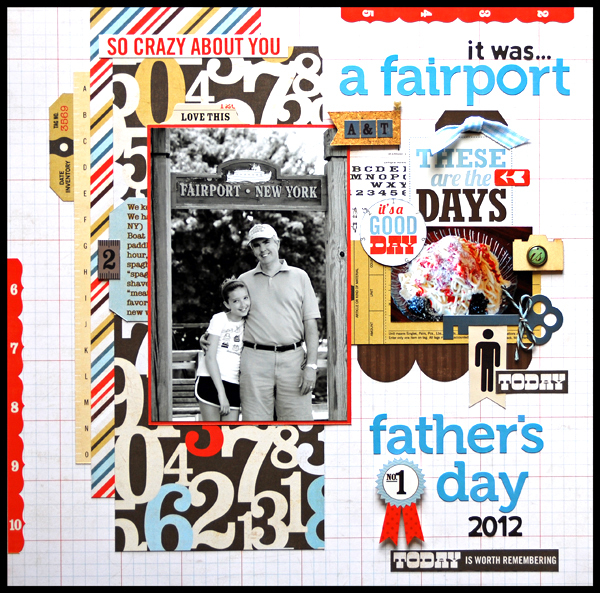 wonderful layout lisa! i love all the details and embellies! and oh my the gelato sounds wonderful! Super cute LO! I want some of the gelato! Great layout! Love the black and white photo which is perfect with these colors and the layering. Spaghetti gelato...my first reaction is yuck. Love this layout! And great paper too! Good papers for you great photo! This layout has a nice, modern, edgy look to it. I never seem to carry that off...but you sure did! LOVE what you did with this collection! So gorgeous! Love the colors and the title! I so love this page girl!!! This turned out super great, Lisa. LOVE it. Totally want to scraplift it. You always do fun things with your titles, splitting them up. Really nice title work here. The punches of red everything look great. Sweet pic too.